The backdrop behind Trump was filled with men in miner’s stripes and hard hats waving “Trump digs coal” signs, and Trump peppered his remarks with his admiration for coal miners. “If I win we’re going to bring those miners back,” he said. As Gutman also reported, Trump is offering no real plan for how he’s going to reverse the downward spiral of the Southern West Virginia coal industry, though he (like West Virginia Democratic front-runner Jim Justice) is making bold promises — promises — in the face of just about every credible projection or analysis of where coal is actually headed (see here, here and here). Just as important, though, is another issue that Trump didn’t talk about at all: The growing crisis facing the pension and health-care funds that cover thousands upon thousands of United Mine Workers of America retirees and their families. … Today, there is a looming health care tragedy unfolding in the coalfields, with potentially devastating human effects. In many cases, the loss of health care benefits will be a matter of life or death. In all cases, it will be a financial disaster that the retired miners, who live on very meager pensions, will not be able to bear. These are real people we are talking about. They live on small pensions, averaging $530 per month, plus Social Security. They rely very heavily on the health-care benefits they earned through decades of hard work in the nation’s coal mines … They spent decades putting their lives and health on the line every single day, going into coal mines across this nation to provide the energy and raw materials needed to make America the most powerful nation on earth. And they did that even though they knew they would pay a physical price for it. 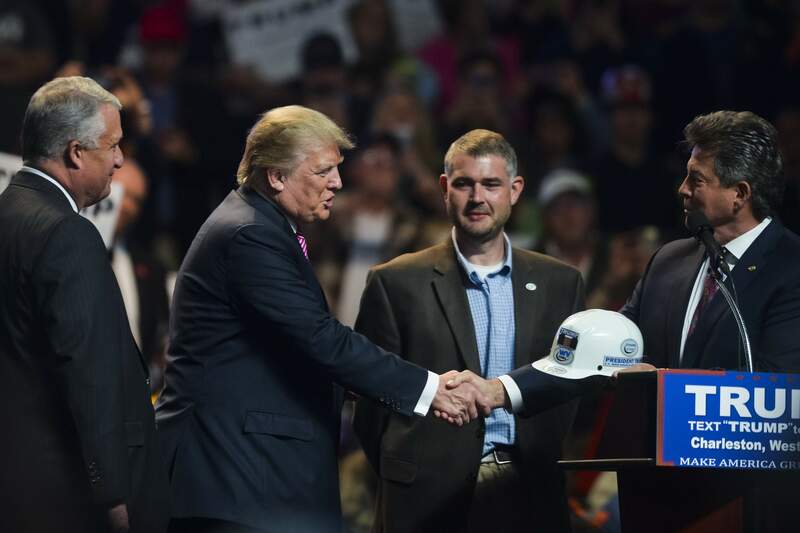 Photo by Christian Tyler Randolph — Donald Trump receives a miners’ cap from West Virginia Coal Association vice presidents Chris Hamilton and Jason Bostic last night at the Charleston Civic Center. At left is Senate President and GOP gubernatorial candidate Bill Cole. It’s important to remember that this looming crisis won’t go away, even if the coal industry were to suddenly rebound. The problems with the solvency of the UMWA pension plan, for example, grow from the 2008 financial meltdown (now, whose fault was that?). Even if employment were to return to pre-meltdown levels, many of the companies that were paying into the pension plan then have since been relieved of that obligation by the federal bankruptcy courts. And even if that weren’t the case, it’s far from clear that the rising contributions alone would be enough. The same goes for the union’s health-care plan financial problems. As we’ve talked about before, President Obama has a proposal for dealing with this crisis. In Congress, members of both parties — Rep. David McKinley and Sens. Joe Manchin and Shelley Moore Capito — have a proposal. Democratic presidential front-runner Hillary Clinton has a proposal. But when the presumptive Republican nominee for president had a huge audience of coalfield families in the palm of his hand over at the Civic Center, he didn’t think that this issue was worthy of mention. Do you seriously think he has any knowledge whatsoever of that issue? I have my doubts. I agree with you, he lacks substance on several fronts. But you concur that Hillary has a plan? How so? So she wants to give them $30 billion to the coal mining communities throughout the United States? How are we going to pay for this? Where is the money coming from? What programs will be cut to pay for this? What are the so called details for the plan? How will those affected by mine closures derive benefit.? Do not blame him, call her out as well. Let’s be straight forward no one really has a real plan, the 17 candidates on the Republican side, the three or so that were on the Democratic side either. And more important what is the plan from the state leadership, like the Governor, the WVDO, the state legislature. US Senators like Manchin and Capito. As usual you fail to hit the entire scope the issue. What I’m writing about here isn’t the broader plans/proposals for diversifying the coalfield economy, but the much narrow — but equally urgent — crisis facing the UMWA health and retirement funds. I’ve already linked to the Obama plan in that post. So sorry, but you’re wrong on this one. In Pennsylvania Trump told us that he would bring Joe Paterno back (from the dead), so if he has these powers, surely he could bring back the coal industry in southern WV? What is there to tell/ All he has to do is stop passing the laws that are decimating the industry for some silly pipe dream about satisfying or energy needs with wind and solar, which is not going to happen for DECADES, if ever, so why are we destroying the coal industry now? All he has to do is say “I am not Hillary” and the coal industry will know that things would DEFINITELY be better with him since she will continue with more and more punishing legislation. $30 Billion would be $2 per month, per family in the U.S. for 10 years. A small cost for the energy they have worked and died for for the last 100 or so years. Just add it to our electric bills. Those workers deserve better than what the Banking Disaster left them with. Well this problem is definitely going to be one behemoth to remedy! But the fact is, the problem should never have gotten to this point! The main question is, under WHOSE watch did this mess take place? And Mr Trump is being criticized for what he hasn’t revealed as a plan yet! The guilty one is who should be carrying the blame for this whole disastrous unjust mess! The tragedy has been created and there is no way the very ones who created it, will resolve it! That is a no brainer! Here is something nobody has raised or that I have heard yet. 1. West Virginian’s are a proud people there still remains few who were raised there that have left and remain in our beloved state and close to family. 2. Hillary is trying to sell that she wants to put companies and miner’s out of work by offering a 30 billion dollar retraining skill plan. 3. OK got it … sounds good? 4. Let’s say she impliments that plan and it is now done. The training has happened. Where is this training going to be put to use? Probably means trainees and their families will have to move and in most likely hood moving them “out” of state. 5. Of those families how many currently have mortgages on homes? 6. This would mean these families would need to purchase another property to live in. 7. Who is going to buy their current mortgage in West Virginia where work in those areas are the mines? I understood Dennis’s point to be that there is no plan unless you include a way to fund a proposal and I agree that Clinton does not provide that. In typical “tax and spend” democratic fashion she proposes billions of government spending which would require billions of increased taxes since Washington is unable to cut government expenses in a meaningful fashion. Continuing the Obama policies of increasing deficits will ultimately prove disastrous to the U.S.
Out of all of the Clinton’s plans for revitalizing coal communities, only one proposes funding- Repurpose mine lands and power plant sites: Clinton will unlock existing unappropriated resources from the Abandoned Mine Reclamation Fund to help finance this work. Of course this is a fund that has been robbed many times to fund a small subset of mining labor, the very politically active and always democratic-favoring U.M.W.A. The union membership has not supported the anti-coal policies of Obama and Clinton but their leadership certainly has, only to see mines close from government policies but receiving money from the AML treasure to fund UMWA pension/health shortfalls. Sad! All very interesting comments. However, I suggest that we consider Pittsburgh and how it dealt with the downfall of the steel industry. As a result of competition with overseas producers and other factors, the steel industry completely collapsed in the late 1960’s and 1970’s. It took a decade or two for the economy to recover but it did and is actually a lot stronger than it was back in the steel days (and there was not a mass-exodus of residents). Today, Pittsburgh is a much more pleasant and more vibrant city than it was before and has a very healthy and diversified economy. I would suggest that WV has never had a vibrant economy and the coal industry has had mostly negative impacts on the economy, the people and environment. Unless you like fantasies, it is clear that the coal industry is never coming back no matter who is president so better to embrace the future. Andrew, It’s a little difficult to compare a city with a state, but I would wager come November Trump will carry both WV and Pennsylvania. There are a lot of people in Pennsylvania who support Trump for some reason. I believe he may well take every state in the rust belt, and If he does it will be because of jobs and the economy. This is what everyday working class people everywhere are concerned with. Everything else is way down on their list. As far as the steel industry goes, China floods the market today with cheap steel. The EPA would never allow it to come back here. It would be hard to compete on a world market with countries that don’t play by the same rules that you have to. It’s the same with the furniture industry that left the South years ago. Almost all furniture today comes from India, China or who knows where. It would be hard to apply finish to furniture on a large scale in this country today because of regulations. So, we let them make and finish furniture where there are no regulations, and you can’t beat that price. My suggestion to consider the comparison with the collapse of the steel industry was given as a good example of how a population successfully adapted to the end of an industry and embraced new economic opportunities. If the coal miners of WV think that Donald Trump or any other politician can return the coal industry to it’s former glory, then that is a fun fantasy for them to enjoy, but keep in mind that it is only that, a fantasy. For those of us that are more grounded in reality, it is pretty clear that cheap natural gas is here for a long time and that the demand for coal is not coming back, just like the demand for steel and buggy whips. Natural gas fills the void. Have you ever compared the BTU rating of steam coal to natural gas? One ton of steam coal produces 25 million BTUs of heat. Compare how much natural gas it takes to equal one ton of coal. I think you will be surprised. As I said, natural gas is filling the void. Also while your at it, notice the output of an all natural gas power plant compared to the output of a coal fired power plant. Another real eye opener. The demand for steel will never die. It’s just that not much of it is made here now. We still build and we still make things. There will always be demand for metallurgical coal for steel production, unless we start building with bamboo. Pittsburgh had roads, rail lines, river transportation, utilities, schools, hospitals, housing, shopping, amenities, etc, etc. So it was a far easier task for them to move beyond steel. The WV coal fields have virtually none of those advantages. No CEO is going to move his operations and employees to the middle of nowhere, for these very obvious reasons. Without a turnaround in the coal industry, its far more likely that the coalfields will continue to de-populate, with future growth only occurring close to where the infrastructure and amenities already exist.